Plantit Perlite has been used by gardeners as a growing media the world over for many years and when you want to improve drainage of your chosen media then use perlite! 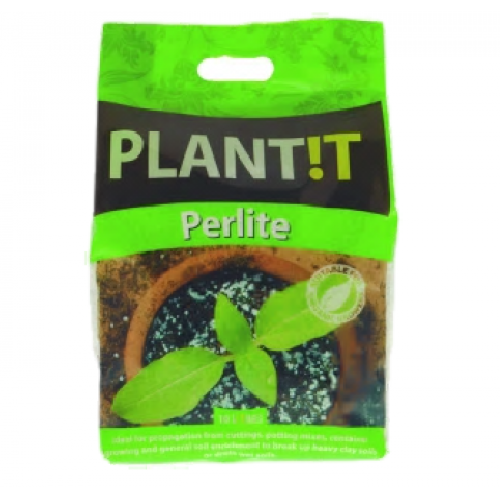 PLANTIT Perlite is a natural pH neutral sterile growing medium derived from volcanic rock. When using PLANTIT Perlite you can achieve faster germination and striking of cuttings due to superior air to water ratio. You can use PLANTIT Perlite to aid in the breaking up of heavy soils. Simply mix with potting soil and it will keep the soil loose and light. This allows air and water to reach roots aiding nutrient uptake and improving plant health and growth. PLANT!T Perlite is easy and safe to handle and odourless whilst also being lightweight and simple to use. PLANTIT Perlite can be used for soil conditioning - increasing aeration and drainage in heavy hard to manage soils; repairing/laying down lawns - giving additional aeration and drainage when raked into spiked holes; and planting trees and shrubs - loosening and aerating soil to encourage root development.